Sold Secure Motorcycle GOLD Approved product. Case Hardened 26mm diameter eye bolt. 59mm internal diameter- Fits up to 14mm dia link chain. 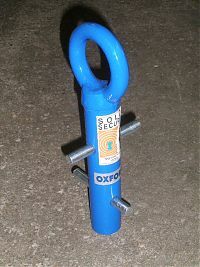 Two loose pins supplied to knock into anchor post prior to fitting. Finished in Blue powder coat finish. Simple and easy to fit- cement post 210mm deep into concrete.